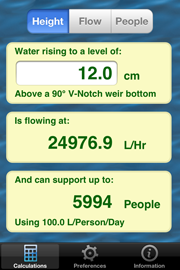 By using a simple height measurement, NotchFlow can calculate the flow of water over a specially crafted V-Notch weir, and through WHO recommendations estimate the number of people that the flow could support. Being able to easily determine the flow-rate of a water source is important for many situations. For example a farmer may want to know how much water he has available for his crops, while an aid worker may want to know how many people could be supported from a given spring. However when you are out in the middle of the countryside is is very likely that you will have little in the way of tools to help you measure a flow-rate. But this is where NotchFlow comes to the forefront! The NotchFlow program is designed to help people estimate the flow-rate of a water course from a single height measurement. It works in conjunction with an easy to construct V-Notch weir that funnels all the water through a well defined V-shaped profile. This geometry simplifies all the calculations and only requires the height of the water above the bottom of the V-Notch to be measured in order for NotchFlow to determine the flow-rate. The program is easy to use and contains all the information required to guide the user in the field in how to construct the required weir, full details on how the calculations are performed and references to external material that further expands on measuring flow-rates and the health aspects of potable water usage. Calculate flow-rate and supported population for a given water height. Calculate supported population and water height for a given flow-rate. 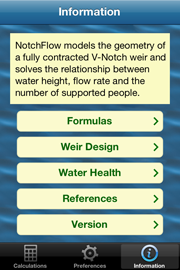 Calculate water height and flow-rate required to support a given population. Units selects between three different units systems: Metric, Imperial and US. 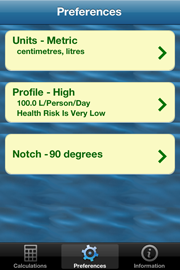 Profiles selects one of five pre-defined per capita daily water consumption profiles that are based on World Health Organization usage patterns. These profiles are used to determine the supported population numbers from a given flow-rate. Notch Angle specifies the actual notch angle used in the weir under consideration. The main formulas used to perform the calculations. A reference design for a suitable V-Notch weir. A summary of World Health Organization (WHO) water quality criteria and an explanation of the per capita water profiles used by NotchFlow. Links to external references on weir design and the WHO water quality criteria. Version information of the currently installed NotchFlow program. 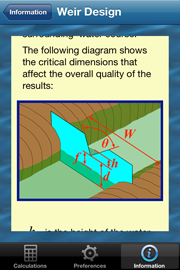 The Weir Design screen is an example of the depth of information that is available in the NotchFlow program.